Most riders have favorite pieces of gear that they prefer to ride in. Items such as a well worn pair of boots that are both comfortable riding and walking in, or a jacket that no longer resists movement. The Aerostich Elkskin Ropers have taken on this role for me. They are daily gloves that are in my helmet as I prepare for the morning commute, and get tossed into my lid every night waiting for the next morning to come. There is nothing ground-breaking or spectacular about these gloves. There are no graphics, no vent holes and no logos proclaiming your allegiance to any brand or team. They are a pair of hide gloves that protect your hands from daily hazards such as bugs, rocks, a gentle rain and grim year after year after year. When you first purchase the Ropers, the hide is soft and supple. After a couple of thousand miles of rain, road grime and sun, they start to shrink and conform to your hands. When I first bought them, I tried to treat them with waterproofing to keep them soft and to reduce the amount of water they can absorb. After a couple attempts at treatments, and a series of hard rains, I learned that the gloves will get wet…and then dry. Let them do what comes naturally. My gloves are used for almost 10 months out of the year as riding protection, wrenching and yard work gloves, or just cool weather hand protection. Only the coldest of winter days will I use something else. They have taken the shape of my hands and grips which means I am no longer working against the leather, they are working with my hand movements, making them a second skin. A good set of gloves is also critical if you have any mechanical issues on the road. The need for a little extra leverage, or just keeping your hands clean while lubing your chain the 5th time can be the best reward for your purchase. There is nothing that spoils a treat of pie and coffee more than grimey paws. My only advice is to stay away from the black dyed Elkskin Ropers. Now it has been many years since I have owned a set of black Ropers7-8 years ago, but the dye in those gloves needed to be soaked out, otherwise your skin will soak it up for you. Purple hands are only funny at the rally or on the road. At work, your fellow workers will wonder about your private lifestyle and Google “purple hands and skin disorder” hoping for answers. My natural Ropers have been with me for 5-6 years and I am hoping to get at least another 2-3 out of them. I like the standard gloves that come to the wrist for the majority of my riding. It allows air to travel up my sleeve for additional cooling, and reduces the amount of hide that is wet, while trying to dry them on the road. I have cold weather gloves when I need to keep wind and heavy rain out. It will depends on you whether you need gauntlet or non-gauntlet. Aerostich offers the Elkskin Ropers in black or natural to the wrist for $38 and a Gauntlet version in black, natural , or 2-tone for $64. You can find Aerostich in Duluth MN or at www.aerostich.com. 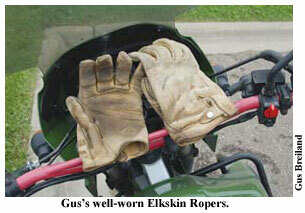 The Roper is not their only glove; take a look and see if you like a deer of a different color.